SatTrackCam Leiden (b)log: USA 161: "The reports of my death are greatly exaggerated..."
USA 161: "The reports of my death are greatly exaggerated..."
The Keyhole, launched from Vandenbergh on 5 October 2001, went AWOL on or short after 24 August, with several observers failing to observe it in a window well around its last orbital position after that date. This lead to some suggestions, covered earlier here, that it could have been de-orbitted. After all, a new Keyhole, USA 224 (11-002A) had been launched in the same orbital plane on January 20, 2011, ostensibly as a replacement for USA 161. Not everybody took to the idea of a de-orbit for USA 161 though. It's much older sister ship in the evening plane, USA 129 (96-072A), was after all still active even though USA 186 (05-042A) had been placed in the same orbital plane in 2005. So why de-orbit the newer USA 161 but leave the much older (and presumably less modern) USA 129 up? Skies were overcast in Leiden at that time, but on 28-29 August it cleared somewhat (with the emphasis on "somewhat"). I tried to cover the nominal plane of the search orbits that night (which meant staying up late to 2 am local time) under conditions that can only be described as abominable (thin and sometimes thicker clouds) but failed to recover the satellite. That could easily have been due to the conditions though. In France, Pierre Neirinck suffered the same conditions. 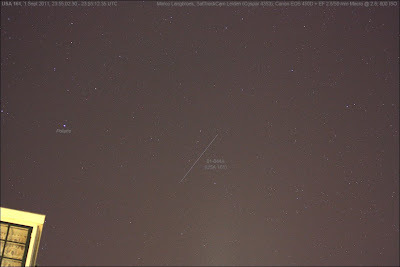 On the night of 30-31 August, Pierre Neirinck in France spotted an object that could be USA 161 near 00:17 UTC. As his sky suffered from clouds, there was some uncertainty in the position he obtained. His observation suggested that the satellite was moving in an orbital plane that was shifted slightly more eastwards than the plane of the search orbits. On the night of August 31-September 1, Björn Gimmle in Norway possibly observed it again near 23:20 UTC, but he wasn't too sure. 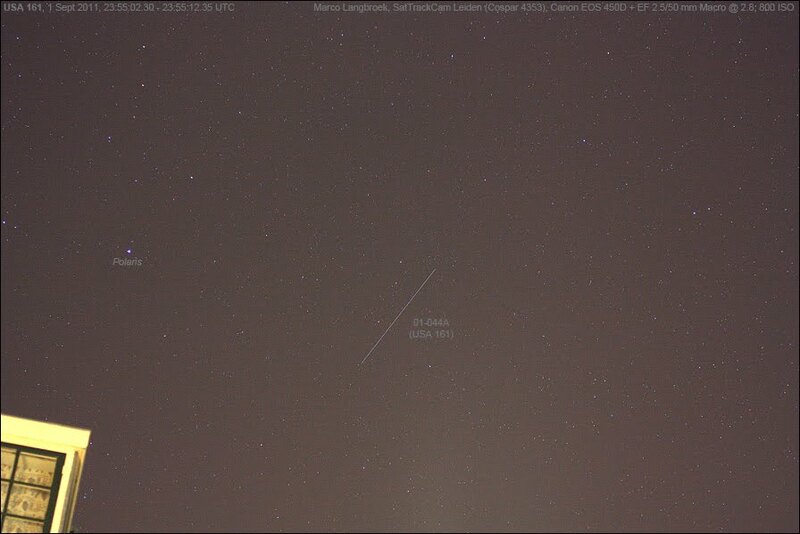 Pierre Neirinck observing from France between 22:58-23:23 UTC did not see it. Neither did I, keeping (under good sky conditions) a visual and photographic watch between 23:31-23:46 UTC. Red October USA 161 turned out to be elusive and not willing to give up it's location easily! Third time is a charm however (or, as we say in Dutch: Drie maal is Scheepsrecht, which is ambiguous to translate beacuse the exact meaning of "scheepsrecht" is under dispute: but it is something like "Three times is Ship's Justice" or "Three times is Alderman's Justice"). On the night of September 1-2, both Pierre in France and I in the Netherlands observed it unequivocally around 23:55 UTC. Keeping a visual and photographic watch under good conditions, I picked it up visually somewhat east of Polaris and under Cassiopeia, and just under the FOV of my camera. I quickly re-aimed and shot two images (one of them shown above), yielding four points. It was steady and at its brightest about mag. +2, a naked eye object. At the same time, Pierre in France also saw it visually and got three points. With these data of last night, the new orbit is starting to get a bit of shape - probably enough for others to recover it more easily the coming nights. Probably not here at Leiden though: the sky has grown very hazy today (thin clouds) and I need some sleep. The very preliminary orbit still needs more observations before it becomes accurate, but it looks like the perigee has been significantly raised to twice the altitude it was (from 303 km to ~590 km), and apogee slightly lowered (from 911 km to ~780 km). These kind of situations, where a satellite makes a big manoeuvre and the hunt is on to recover it, are always exciting times where the hobby gets most fun!